A true gem! 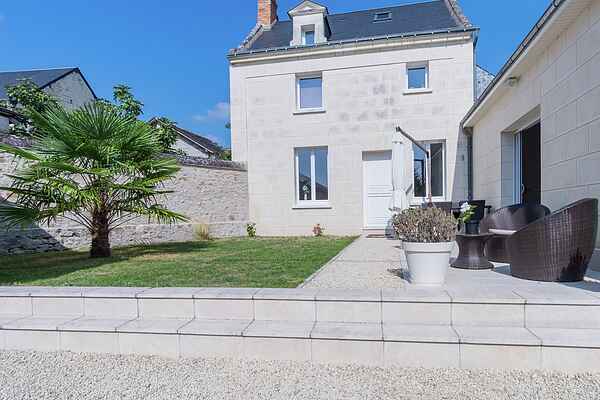 This unique, brilliantly renovated holiday home is located in the village of Beaumont-en-Véron, in the département of Indre et Loire, a region rich in vineyards and natural beauty. The design of the interior is clean and modern, making ample use of a black and white colour scheme. Doors from the comfortable living room open out onto the terrace. The sleek bedrooms too boast a great view of the lovely surroundings. There is a wonderful, enclosed garden to the south of the house. Here you will enjoy premium privacy with a luxury patio set, sun loungers, and a BBQ for a cosy evening meal. The children can run and play on the lawn while you make plans for the next outing. Grocery shopping available in Chinon (7 km). While in Chinon, be sure to try a glass of the town's famous red wine. Pay a visit to Montsoreau (13 km), Azay-le Rideau (27 km), and Saumur (27 km), each with their own lovely château. Follow the wine routes through the vineyards of Loire-Anjou-Touraine, where you can taste many wines along the side of the road and of course, pick up a few bottles to take home with you. The Vienne River boasts many beaches, great for sunbathing or a picnic. 18-hole golf course at Roiffé (24 km).